This article is updated whenever Microsoft releases new Cumulative Update for Windows 10. The intention of this post is to inform readers about changes offered with new updates. Though you may be offered various updates on your Windows 10 but Cumulative Updates are those updates which fixes your system as they offer a group of hotfixes applied. Therefore it is necessary that you should have detailed information about these updates, before you deploy them. If you’ve customized your system settings, it will help you to judge whether you system should go for particular update. In this article, we’re providing you the necessary change-log for every new Cumulative Update pushed by Microsoft. The latest Windows 10 Cumulative Update available right now is KB4493509 and it updates your system to build number 17763.437. The update applies to Windows 10 Version 1809 (Windows 10 October 2018 Update) and it released on April 9, 2019. You can install this update using Windows Update or via Windows PowerShell. To know complete list of files changed with this update, check this link. Here is the list of all Cumulative Updates released for Windows 10, till date. This list will help you to track which update was failed/not installed/not offered to your machine. You can read change-log of these updates in detail on this page. Please check back this post to have information about latest Windows Update available. If you can’t detect/download/install updates, run Windows Update Automated Troubleshooter or reset Windows Update components manually. To uninstall installed updates, check this guide. To block this update, check this guide. Have been trying to install KB4013429 in windows 10 Pro , OS version 1607 for the last three days and after eight unsuccessful tries, I have given up. Very irritating, it reaches 99% installing and would”nt complete the updates undoing changes and of course reverting to roll back the install of KB4013429. windows update. No viruses or malware on the system. Any help to fix this problem would be much appreciated. Thanks. Nlthcn. I had followed the steps mentioned in the below page also , but no luck . Please help us. almost 70 machines got effected on this. I had followed the w4y4xrjxpv99996gqg76f4yfz steps mentioned in the below page also , but no luck . Please help us. almost 70 machines got effected on this. 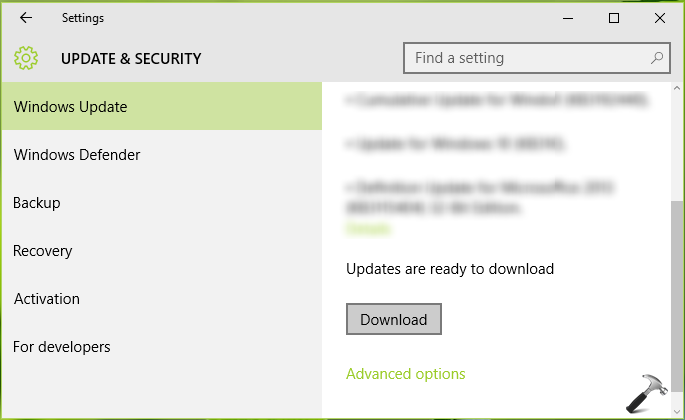 None of the cumulative updates, including KB4089848, has installed since the successful install of KB4053517. Hence, I am stuck on build 16299.125. I have tried all the fixes I can find on the web, short of using the media creation tool to do an in-place repair. Is this now the only option to get to the current build? ^^ Open administrative Command Prompt and type following commands one-by-one followed by Enter key. Sir, I have spent a few days on this but I come across your site from post in another discussion forum. Herein from above lies exactly the problem I have now. I feel there is no way to get this back but you are my only hope if any now. When I try to log in my Windows 10 Pro the screen will bounce from all black to showing the black screen with Task bar ever so briefly and back and forth it goes until I do a Ctrl-Alt-Del and login to another user profile. Of course my login is the oldest and hence why this latest update has wiped my profile apparently. So, is there any way to restore my profile or is it gone forever? I was going to delete my user account and recreate it but a warning shows that I would lose some items that I did not want to take a chance with that. Thank you in advance! ^^ Have you tried uninstalling the update?